Cropping means to trim away some of the perimeter of a photo. When you take images on your Nikon D5600, you might crop a photo for compositional reasons, removing excess background so the subject fills more of the frame. Or you may need to crop a photo to create an image that has proportions other than the 3:2 aspect ratio of original images captured by the D5600. The Retouch menu’s Trim tool enables you to create a cropped copy of a photo right in the camera. However, always make this your last editing step because you can’t apply any other Retouch menu tools to cropped images. Set the aspect ratio: You can choose 3:2, 4:3, 5:4, 1:1, and 16:9. (Hint: Use 1:1, as in the figure, to fit the frame size used for Facebook profile pictures.) To cycle through the settings, tap that Aspect symbol, labeled in the figure, or rotate the Command dial. 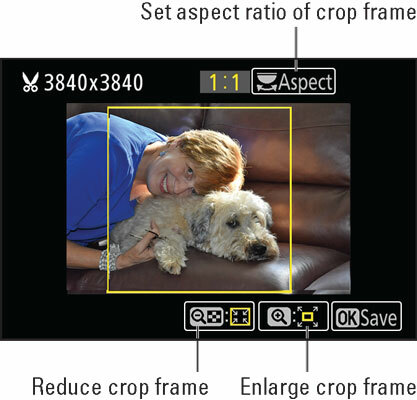 Adjust the size of the crop frame: The current size, stated in pixels, appears in the upper-left corner of the screen. To reduce the frame size, press the Zoom Out button or tap the Zoom Out icon; to enlarge the frame, press the Zoom In button or tap the Zoom In icon. Each press or tap further shrinks or enlarges the frame. The range of sizes available depends on the original pixel count (resolution) of the photo. Reposition the frame. Drag your finger inside the crop frame or press the Multi Selector up, down, right, or left. To create the cropped copy of your photo, press the OK button or tap OK Save on the touchscreen. When viewing your photos in the default playback display mode (as well as certain other display modes), you see a scissors symbol near the Image Size readout. This symbol is different from the one that appears if you use the Resize option, which creates a lower-resolution version of the entire image, maintaining the original 3:2 proportions.